Check the centre mirror to check the speed and position of following traffic, then the right mirror to check for any overtaking vehicles. Think about where you will apply your signal. Ensure there are no other junctions or major openings on the right before the junction as your signal may give the impression you are turning into one of them. If there are any other junctions delay the signal until you have passed them. You may even have to apply the brake first. 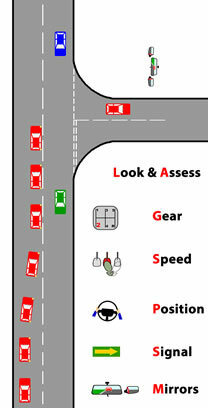 Use the correct road position on approach normally slightly left of centre line if safe. This may need adjusting if there are parked vehicles on the right for instance with another vehicle approaching and wants to overtake the parked vehicle. As you ease off the accelerator the car will start to slow down (engine braking), then brake progressively to reduce your speed. Avoid changing down through gears. This distracts from the manoeuvre, uses more fuel and won’t show the brake lights on the back of the car. Changing gear as necessary. When you are approx 3-4 car lengths from the turn you should have reduced your speed to approx 15 mph. This is when you would need to dip the clutch in an average diesel car, you could get down to 10 mph in an average petrol car, otherwise it will start to judder. Open Junction. If you have a clear view into the new road select 2nd gear, bring clutch smoothly up and steer briskly around corner lining your right door mirror up with the centre of the new road to avoid a corner cut unless necessary due to parked vehicles in the new road. If changing in to 2nd gear, you must ensure that as soon as the change is made you bring the clutch back up. If the clutch is left depressed the car will be rolling (coasting) and if left in this state you may find the car uncontrollable as you try and turn. Ideally your speed will be about 10-12 mph as you make the turn. If you are not sure on approach whether you can make the turn before the approaching car reaches you, change into 2nd gear. This way if you can make the turn you are already in the correct gear to keep going, however if you decide not to make the turn you can always slow down more and change into 1st gear. To help you to judge the turn with an approaching car, ask yourself "would you walk it?". I.e. if you could walk to the junction you should be able to drive it! Closed Junction. If you have a restricted view into the junction then apply more footbrake and slow down to 3-7 mph select first gear, set gas find biting point and either creep car into junction or raise clutch smoothly up and drive in at 3-7 mph. If you can’t see into a junction until you’re virtually turning the wheel then 10-12 mph may be way to fast! Remember every junction is a pedestrian crossing point! People double park cars very close to junctions! Look into the new road to see if it is safe to turn into, if the road is narrow with parked cars you may have to wait for another car to emerge before you yourself can turn into it. It could be dangerous to turn in to a road before you can see directly in to it. If pedestrians are already in the process of crossing the road you will have to give way to them. Once you have straightened up, have a quick look into the centre mirror to see what may have followed you.